I’m Renee and I am a minimalist. Not only that I’m a minimalist with kids. This isn’t a thought I walk around thinking about on a daily basis because it has just become a way of life. So I had to pause for a moment to think about just what it has meant for us living a smaller life with our kids. You may know by now that downsizing changed things dramatically and for the better. Downsizing worked for our family as a whole, but how has it worked for just the kids? What do we do when it comes to managing toy clutter? Do we allow them freedom to choose their room decor or do we buckle down because we know less is best? Let’s talk minimalist living with kids. 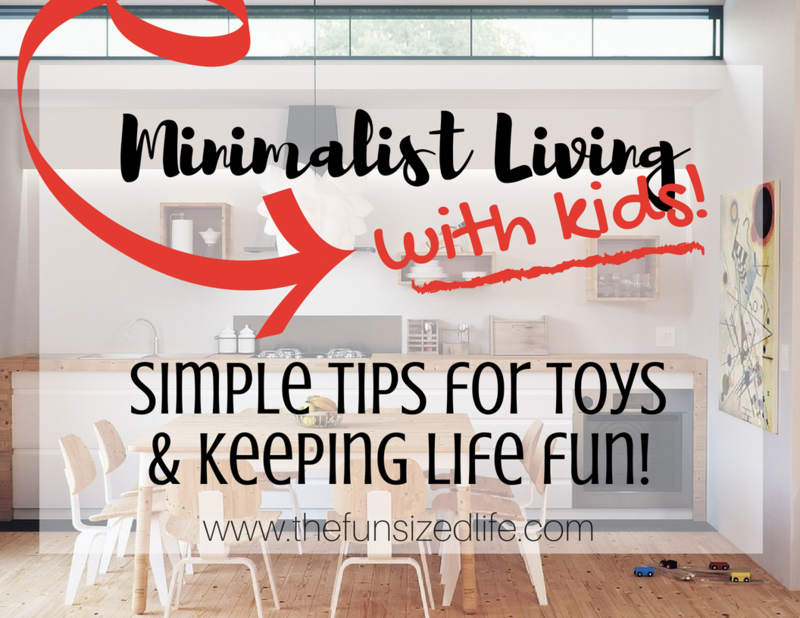 I’ve got some simple tips for toy clutter and how to raise them minimalist while keeping life fun. There is no denying that there are huge benefits to introducing minimalism in childhood. Chances are you have heard by now that psychology has shown the strong correlation between depression and clutter. If clutter is affecting adults and aiding in depression, why wouldn’t the same be true for children? There are some major ways that children will benefit from life with less. Gone are the days of constant entertainment. We already live in a world that is over-stimulating and leading to lower attention spans and more destruction. Why more destruction? Because people, in general, are forgetting how to work for things. We are so used to getting everything we want at the touch of a button. Removing some of this clutter, technology, and chaos from our children’s lives allows them time to focus and get creative. Take away the toys and see where their imaginations take them. I’m not saying all the toys. I’ll touch on that later. I don’t know about you but I was spoiled. Spoiled, spoiled, spoiled. Dad, grandparents, mom, they all spoiled me in some way or another. Unfortunately, I grew up always feeling this constant need for new, shiny things because of it. After all, going to Toys R Us (rest in peace) with my grandma always made me happy. Taking home a new Barbie or Barbie accessory always brought joy. Why wouldn’t that carry on into my adult years? Lessening this need for children is a huge way to reduce the chance that material objects will get a grip on their lives. No one wants to be controlled by things. Minimalism in childhood is a great start at preventing this. My personal favorite thing about minimalism has been having less inside my house to maintain. When I don’t have to spend all the live long day indoors cleaning and tending to my stuff I suddenly find myself with more freedom to get outside, take vacations, and enjoy the world around me. Freeing up this time for parents means more time spent with your children. Exploring, playing and laughing together. Stuff should never get in the way of these precious moments. There you have it. My top 5 reasons why I love being a minimalist. The thing is, my kids, love all of these reasons too. Allow your children to see all the benefits of minimalism and help them understand just why you are choosing to live a life with less. 7 Minimalist Mom Techniques. How to Be a Better Mom by Doing Less. Now that you’ve told them a little bit about why you have chosen to get rid of some of your things, downsize the house or all around lead a simpler life, make sure you let them lead their own journey. No, they may not make the same choice as you. While this can be stressful, I encourage you to take some deep breaths and allow them to follow their own inner compass. You are in control of the house as a whole, but your children should feel like they are in control of their lives and decisions as well. As children, what should they have a say in? Mom and dad don’t buy them – Toys will make their way into your home from grandparents and other family and friends. If you don’t believe in adding to the toy clutter, then don’t. Out with the old, in with the new – When events like birthdays or Christmas start creeping up, get out a box and encourage your children to fill it up in order to make room for the new things they are asking for. Pick a room for toys – If you don’t want your living area filled with toys, then make them “off limits.” There is nothing wrong with asking your kids to keep toys in their room or playroom. Toss with caution – Let’s not pretend like this won’t happen. When you get into cleaning mode and start tossing old stuffed animals you know have been forgotten just make sure you hide them really good at the bottom of the Goodwill pile! This one can be tough for any mom, especially a mom who doesn’t want clutter. Allow your children to show their personality and style by letting them have a say in their room decor. For your family, maybe that means letting them choose the paint color or allowing them to hang their favorite pictures on the wall. Work to keep the room as simple as possible with just a bed and a dresser and then allow them to make their space their own. If there is a toy your child really wants, encourage people to purchase that specific toy. Filling people in on something that your child really has been wanting will allow them to bring your kid joy without filling your home full of toys that you know will go unplayed with. Tell them some of the things your child needs. If people really want to bring a present, why not give them ideas on new books, art supplies or even clothing ideas? Your child will benefit from all of these things and you can help manage the storage of them. Encourage gifts that are not materials. Have your family been wanting a Science Museum membership? Does your child love bowling or going to the movies? Why not let people know a gift card to these places would be preferred? That way people are able to give and you have new ways to spend time together outside of your home. Be understanding of other people. Some people show their love through gift giving. You know your child(ren) won’t play with the toys and it will just add to the mess. Don’t tarnish any joy these gifts bring them or the people who give them. The one thing you don’t want when raising minimalist children is making them feel like they aren’t entitled to anything in life. If they go through life feeling like they were deprived of their opinions or toys then chances are they will grow up consuming as much as they can in order to make up for a childhood of lack. That’s why I strongly encourage allowing children to have their toys and have a say. Allowing them these luxuries doesn’t mean that you can’t still teach them good minimalist practices. Minimalism can affect them in good, healthy, positive ways. Make sure you make them aware of those rather than making them feel deprived. Finances – Show your children how much money they are able to save by not constantly spending it on things that they don’t need. One thing we have done with our children is making a competition out of who has the most money saved! When they get money for chores or birthdays, we take the majority of it and put it into their savings. We then print out the receipt and they get to see their savings number go up! Get more information on the best savings accounts to build wealth. Cleanliness – Discuss with them how keeping a simple house means less time cleaning! Time – Let time cleaning means more time having fun! This is the easiest ones for kids to understand because chances are they don’t like cleaning in the first place! Priorities – Talk with your kids about what they want the most in life. To go to Disneyland, to go to the moon, to play the guitar. Then help them work toward those goals and encourage them to avoid any clutter that might stand in their way. Just like someone growing up in a hoarder house may later appreciate minimalism in their life, the opposite could very likely be true. Children who grow up feeling deprived through minimalism may end up desperately trying to find joy in material things. The very thing we as parents try to prevent. That’s why it is so crucial to allow them to follow their own path while you gently coach from the sidelines. The best way you could show your children the benefits of minimalism is to lead by example and allow them to make their own choices. If they see that you are happier, freer and more financially stable, then they will eventually catch on to the benefits.